•The Product list on the left shows all the products selected for this build operation. •Select a product in the list and click on Last Product Change log entries at the bottom to display all your product changes descriptions since your last distribution. This data is used to generate the Product update description. Your end-users will see this if they are updating their product from a previous version. oProduct version: incremented from the last product version distributed with BLT (or 1.0.0.0 if this is the first distribution of the product with BLT). oOther settings: Last values used for the selected product(s) when last build in Advanced mode. oProduct version: Version of your executable as defined in the Version Information section of the Application Property dialog box of your executable in LabVIEW. oInitialization VI: (optional) Specify a VI that you want to execute before everything else (even the activation process). The VI will run only once on every machine that gets this updated version of the product. You only need to specify the top-level VI that you want to execute and all its dependencies will be automatically packaged with the update. oPackage EXE: Check this box to compress all the content of the build target directory into a single zip archive. A product update distributed with BLT needs to be packaged into a zip file. If you don't check this box, you will be prompted to specify a zip file containing your updated application. oDistribute Product update: Check this box to upload the zip archive containing your update on your Product Update Server via FTP. This also generates a new product version in BLT so your end-users will get notified that an update is available. They will see the release notes and will be prompted to automatically download and install the product update on their machine. o Auto Update: Check this box to force your end-users to install this update. The automatic download and installation process will start without having them the choice to cancel. If you don't check this box, they will be asked if they want or not to download and install the update. If they click No, they will not be asked again until they restart the product. o Required Update: Check this box to specify this product update as Required. When a BLT client application is checking for available product updates, if there is required updates between the current version installed on the client's machine, and the latest version available, all the required updates will be downloaded and installed before the user can get the latest product version. 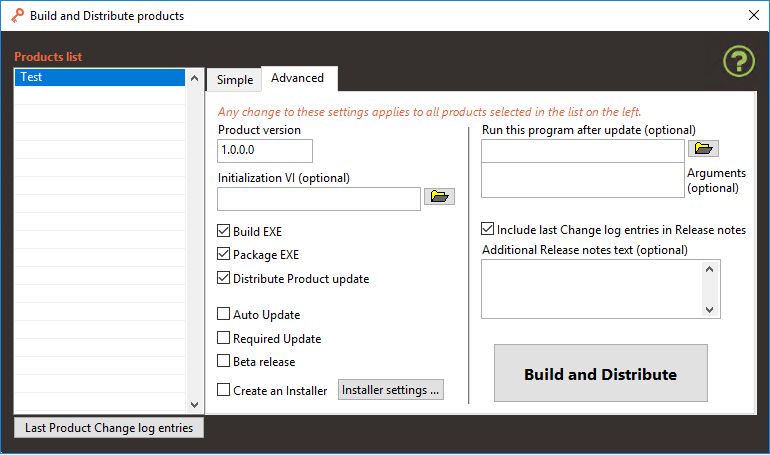 This allows you to force install of specific updates that might include particular processes that should absolutely execute on the client's computer. oBeta release: Check this box to distribute this update as a Beta release. Only Licenses with the "Allow Beta releases " attribute enabled are able to see updates published with the "Beta release" attribute. oCreate an Installer: Check this box if you want to generate an Installer for your product. This installer will include in a single executable file everything needed to install your application and run-time engines on the machine of a new user. Click here for more details about creating Product Installers. oRun this program after update: (optional) Specify an executable file or program that you want to execute right after your product has been updated and before it restarts. You can for instance specify the new version of the LabVIEW Run-Time Engine. So the LabVIEW Run-Time engine on the end-user's machine will be upgraded before your new product versions starts. You can also specify Arguments and perform quit installs. oInclude last Change log entries in release notes: If you check this box, all the last product change log entries since the last time you've distributed this product with BLT will be automatically includes in the release notes for your end-user. You can also set or add an Additional release notes text. •Click on Build and Distribute to process all the products in the list sequentially. •You can follow the status of the build in the active task table at the bottom of BLT Home interface. •You will be notified when your product is distributed. •See here how to manage your product versions.